Northern wildfires and climate change are fuelling each other, a new study shows. "Increasing temperatures … [are] going to result in increasing fire in both Alaska and Canada," says Merritt Turetsky, lead author of the study published this week in Nature Geoscience. "This results then, according to our data, in more greenhouse gas emissions, which then feeds back to climate warming through the greenhouse effect." Turetsky, an ecology professor at the University of Guelph, and her collaborators found that the area of interior Alaska that burns each year has doubled and the amount of carbon dioxide released by wildfires has tripled over the past decade relative to the previous 50 years. Greenhouse gases such as carbon dioxide that trap heat in the Earth's atmosphere have been linked to global warming. Merritt Turetsky talks to CBC's Quirks & Quarks Dec. 11 at noon on CBC Radio One. 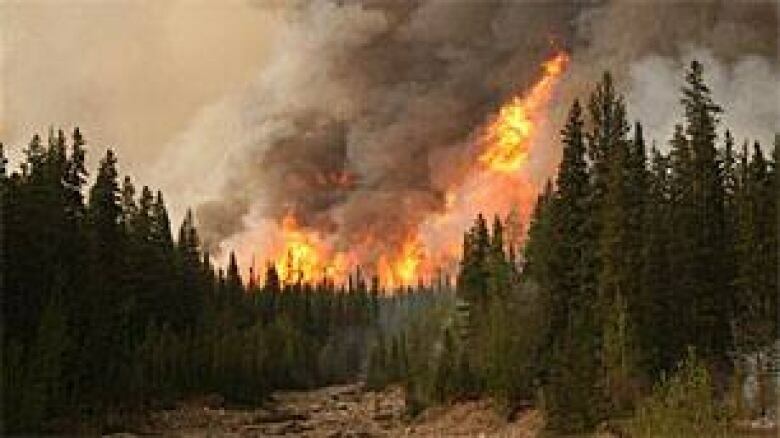 In 2004 alone, Alaskan wildfires released 52 million tonnes of carbon dioxide over a season of three to four months. "That's equivalent to the amount of carbon released by all domestic airline flights in the United States for the entire year," Turetsky told CBC's Quirks & Quarks. While her study focused on Alaska, she said "very similar patterns are held across Canada." A warmer climate causes ecosystems to dry out, leaving them more vulnerable to fires. Turetsky said the fires are burning more deeply into the forest floor, releasing stores of carbon from thick layers of moss and peat. A key uncertainty is whether, in the future, peatlands and muskeg, which hold tremendous amounts of organic matter, may also become vulnerable to burning, Turetsky said. Currently, they are protected because their soil is extremely wet and much of it is locked up in permafrost. It's possible that current wildfire trends may not continue over coming decades, Turetsky said. Boreal forests are made up mostly of conifer trees, and they may gradually become displaced by deciduous trees that fare better in warmer climates and burn very differently. In the meantime, wildfires are an increasing problem, and not just from a climate change perspective. Turetsky noted that wildfires threaten the lives and property of people who are increasingly settling in the North, exploiting resources such as oil and diamonds and enjoying recreational activities there. Turetsky said just a small amount of warming in recent decades has already reduced snow cover, caused degradation of permafrost and increased burning in northern ecosystems. "Climate change is a global issue, but its impacts are already being most strongly felt in the North," she said. "The North is a sentinel for change."